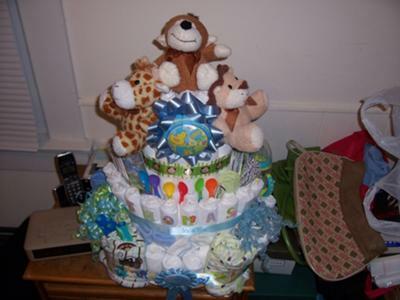 So many creative ideas from this awesome diaper cake! Fun colors, toys and ribbon :] Thanks Sheila! 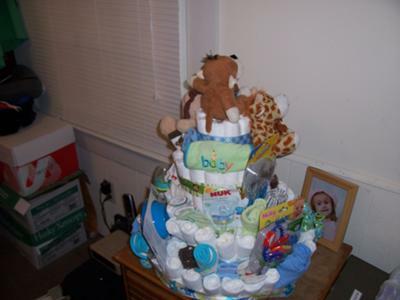 Made a 4 tier diaper cake with a safari theme. Use 2 9 oz. baby bottles each filled w/ candy to support cake. 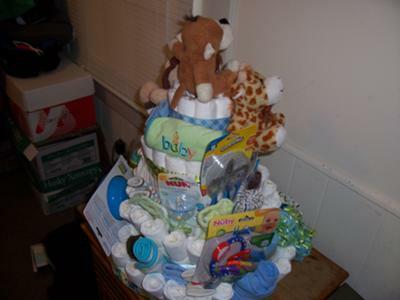 Bottom tier 67 diapers, next tier 41 diapers, next to top tier 21 diapers and top tier 8. Used size 2 pampers swaddlers diapers. Used clear and regular rubber bands. Then decorated w/ all kinds of baby items - stuffed animals, onesies, wash clothes, bowls, pacifiers, teethers, etc.